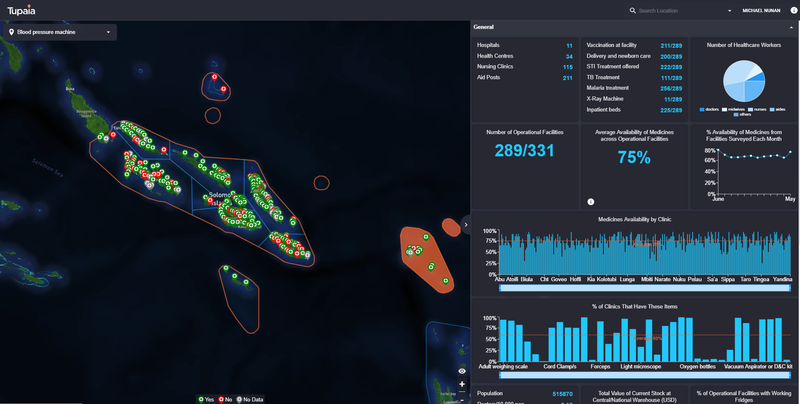 Returned Australian volunteer, Michael Nunan, recently won a Public Sector Innovation Award for Tupaia - a data visualisation tool for improving health care in the Pacific Islands region. Michael says Tupaia had its genesis from his time spent two years volunteering in Solomon Islands as a Chief Pharmacist through the Australian Volunteers Program. This post was originally published by the Australian Volunteers Program here. With the support of $2 million funding through the Australian Government’s innovationXchange, Michael has developed a health resource mapping tool now used by health staff across six countries in the Pacific Islands region to respond to a clear need he identified during his volunteer assignment to improve access to timely and reliable data about health facilities and pharmaceutical stocks. The story highlights how volunteers and innovative development solutions make good partners, with the innovationXchange embedding innovation across the Department of Foreign Affairs and Trade’s work, including foreign affairs, trade and development programs. The Tupaia dashboard displaying the availability of supplies in Solomon Islands. See more at Tupaia.org. Michael’s strong bonds with the Pacific Islands region provided inspiration for the name of the project — Tupaia — who was a legendary Pacific Islands navigator who joined Captain Cook’s crew in Tahiti. He was said to be able to map the Pacific with greater accuracy than using the most modern tools at the time. His namesake is now able to map health systems in low and middle-income settings to help governments in the Pacific Islands region to fairly distribute health resources, respond to disasters and strengthen services. Tupaia also gives donors a bird’s eye view of performance metrics and helps patients to locate appropriate care more quickly and safely. How did volunteering as a Pharmacist lead to this complex health tool? ‘The idea for Tupaia originally came out of a very frustrating conversation I had with an advisor in 2008, when I was in my first year of volunteering in Solomon Islands. They approached me and said that “we needed to do more in Western Province” — “a medical team has just returned from a clinic up there and they said there are no medicines”. I replied and said, “Well… which clinic was it?” They didn’t know! I also suggested politely that there must have been some medicines but no, they were adamant and pharmacy division was in the firing line. From his time in Solomon Islands, Michael learnt a great deal about himself and the diverse country he found himself in for two years. He regards his time as a volunteer as some of the most amazing, intense and challenging years, but also says that those years helped to shape the rest of his life. The Australian Volunteers Program aims to place 5000 volunteers into 26 countries over the next five years. It matches a broad range of skilled Australians with organisations in developing countries to help these organisations to deliver on their own objectives. To find out more about becoming a volunteer and current opportunities visit the Australian Volunteers website. 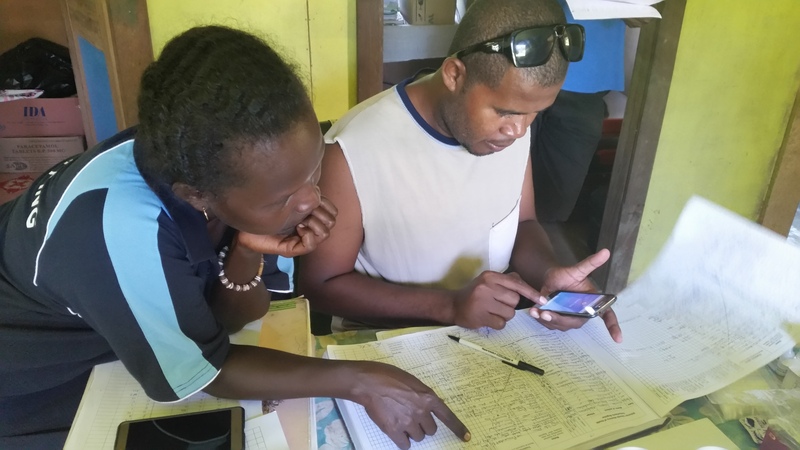 Thelma (Pharmacy Officer) and Reginald (Pharmacist) completing Tupaia surveys in Western Province in Solomon Islands. Photo credit: Louise Vella. Featured image at top: Michael Nunan (second from right) with (from left) DFAT Chief Innovation Officer Sarah Pearson, Senator Zed Seselja and innovationXchange team member Michael Rees. Photo credit: IPAA. How can we vaccinate children in the remote parts of the Pacific?